Howard Training Center has a program called " Golden Opportunities" that is a day program for adults with developemental disabilities who have reached the retirement stage of their life or who may be experiencing early age onset. Instructors support the participants and offer opportunites each day to participate in the community. Activities focus on maintaining and preserving independence and stimulating each participant to thrive. 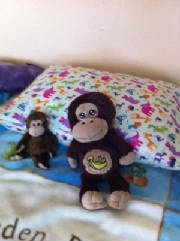 One of the participants, Nona, began exploring different options and came across Sweet Pillow Blessings. Nona and some of the other participants wanted to give back and help children in need along with fellow seniors. This is two fold for us as they are helping making pillow cases for our different projects and it's also helping them to feel valued as well. Golden Opportunities Program goals is to maintain and enhance the independence, current health and sense of purpose for disabled seniors. We feel blessed that we have them to help us with projects and at the same time they are contributing. I feel very happy that Nona was key in bringing this to fruition. A special thanks also to Melanie ! We are working with Alexandria House. This wonderful organization that was just seen on Sunday's T.V. show, "The Secret Millionaire" on 3/27/11, was founded in 1996. This is a non-profit transtional residence. It provides safe and supportive housing for women and children in the process of moving from emergency shelters to permanent housing. This home is located in the Los Angeles area in a broader neighborhood community, that also provides educational and enrichment oppotunities for everyone. Judy Vaughan is a wonderful person. She, along with others, understands the needs of the women and children. They are instrumental in providing the Mother's to be on their own, in a safe enviorment with the "tools" needed to make it. When the Mothers and children leave, we want them to take that special item that they can use now, and after they leave, so that thry have that personalization they so need. Please help with either new pillow cases for the children and Mom's, or if you can sew or embroider some, that would be great also. Children's Hospital Central California This premier pediatric medical center was founded by 5 Mothers who wanted to have a Pediatric Hospital in Central California. In 1949 their dream became a reality. This center provides critical care to a 349 bed unit for children from infants to teens. The Hospital provides high quality and comprehensive health care services to children, regardless of their ability to pay. This state of the art Hospital is the 2nd largerst Hospital in the State and they perform more than 9,000 pediatric surgeries a year. They provide healthcare solutions, information and advocacy for children in an expanding market place. St. Christopher Care Centeris a special place for seniors with a comfortable and secure enviornment. This is a 36 bed unit facility that is located in Hayward, CA and is a 24 hour skilled nursing place for long term patients. This facility has been family owned for over 22 years and provides on and off campus daily activities and recreation, goal oriented therapy, warm home like surroundings and lush garden settings. Healthy diets and proper nutrition is provided. The staff and volunteers are dedicated in providing loving care to the families and their residents. 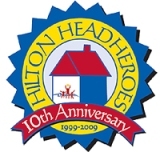 We have worked with Hilton Head Heroes located in South Carolina. This wonderful 501C3 charity founded by Gregg and Lindy Russell, provide families with children that are suffering from life threatening illnesses resort vacations on Hilton Head Island. We want to provide each arriving Hero child and their siblings pillow cases, in order that each HERO will have their "Sweet Blessings" pillow while they are on their Hero vacation and then get to take it home with them when they leave. This is Christian, who went to the Hilton House with his family. Holding the pillow Janice Doty made for him. What a wonderful smile on his face.